On the road trip to the north east of the main island you pass through two totally different landscapes. Leaving Ushuaia, you thread your way between towering mountains and along the sides of huge glaciated valleys till you get to Lake Fagnano, formed thousands of years ago by a super-glacier that shaped the whole area. Once you get past the lake the land is totally flat without any distinguishing features, except strange untended forests of dead trees and fenced off plains with grazing cattle and sheep. Our minibus (Lider the most reputable bus line) stops halfway at Tolhuin, a small town at the end of the lake with just 1400 souls, but the third largest town on the Argentinean side of the main island. The rest stop is Panaderia La Unión, a bakery famous in Argentina for the number of celebrities who have stopped off for a bite, and who’s photos line the walls. We finally got to our destination after 3.5 hours of rough roads and bizarre weather conditions (burning heat on the way there, rainstorms and sunbursts on the way back). Rio Grande is the second largest urban area (55,000 people) on the non-Chilean side of Tierra del Fuego, but unlike Ushuaia, it’s hard to find anyone who has anything good to say about it. Coming into town it looks like a large rubbish strewn industrial estate, although it gets nicer the closer you get to the sea. I was told I was very lucky to get good weather as the usual meteorological situation is lots of rain and strong winds (they even have to close the schools sometimes because of the wind!). Points of interest include a large plastic fish on a roundabout on the outskirts of town which proudly announces that Rio Grande is the international trout capital, whatever that means and they also apparently have the world’s largest sheep shearing shed. It’s also the nearest land to the Falkland Islands, or Malvinas as the locals call them. The islands are always marked on maps as belonging to Argentina and geographically speaking, you would have to agree with them. I only spent two nights here, thankfully, and was put up at Posada los Sauces which, although there are other hotels, is probably the best place to stay. It’s on a main road facing the sea so you can get a good walk or run in along the waterfront path. The Posada itself is clean and neat and there’s Wi-Fi in the rooms. The restaurant is supposedly one of the best in town but is closed on Sundays (the day I arrived) and they only had sandwiches in the upstairs bar. All the places suggested by Lonely Planet and Moon Travel either had imprecise location information or had moved or shut down (except for Tante Sara, a cafe chain from Ushuaia, untried except for their excellent salty or sweet medialunas and other bizcochos) so I asked reception (not usually a good idea) to suggest somewhere and they sent me to La Colonial (Intermediate C+) at 828 San Martin, (turning right off Belgrano, go past Carrefour and it’s two blocks down on the right after Estrada) open Sundays. On the face of it, a posh modern Italian, but really a backwoods interpretation and not like anything you’d get in Italy, despite the number of Argentinians with their roots in that country. I was the first to arrive at 8.40 (think they open at 9 usually) and all 70 seats were full by 10. I liked the music, trombone dub reggae, which seemed to be playing everywhere I went in Tierra del Fuego. To start ‘tallarines’, or durum wheat noodles, a popular pasta which looks like cubic spaghetti, that you will see on menus everywhere in Argentina. You get a choice of sauces so I went for Arrabbiata, hoping for some heat. No chance of that here, the locals are not fans of the chilli pepper and this variation instead had diced bacon and spring onions, edible but disappointing (C). I had to try the trout which the city is famous for and went for the Fines Herbes sauce option, which was gloopy and yellow (D) but once you had scraped it off, the trout was pretty good (B). To finish, the panna cotta with delicious stewed forest berries (B), if a bit heavy on the gelatin. There was too much of the creamy bit and not enough berry sauce and I only got through half of it. 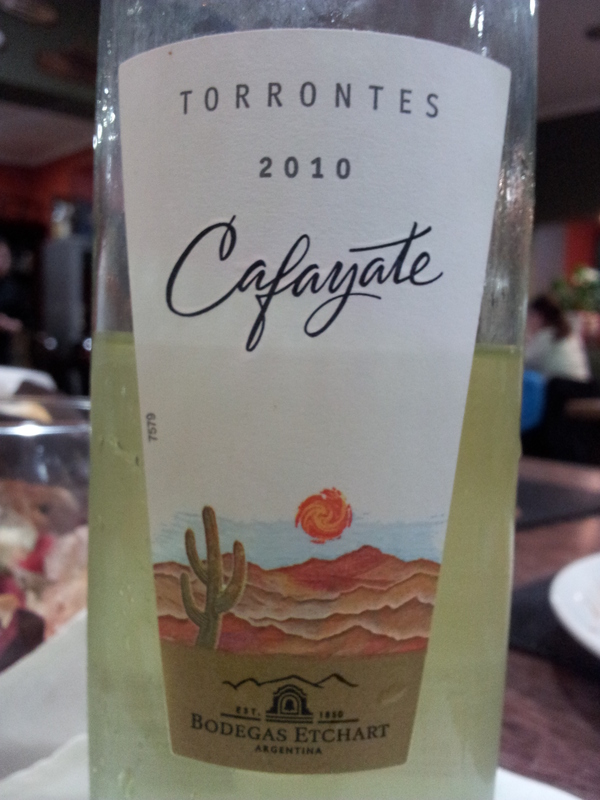 The saving grace was the house white, a wonderfully fragrant Torrontes called ‘Cafayete’, from Bodegas Etchart in Salta, which was a steal at only $40, about £6 (A+). Total cost with a salad and another delicious (but not frozen) Tres Plumas limoncello was $226, much cheaper than anywhere in touristy Ushuaia, but not as good. The next night I tried the in-house restaurant at the Posada which I had been told was the best in town by the local teacher I was working with. According to my friendly waiter, the best choices were the king crab, steak or the lamb. I went for the latter, wanting to relive my Ushuaia experiences, but was not impressed. 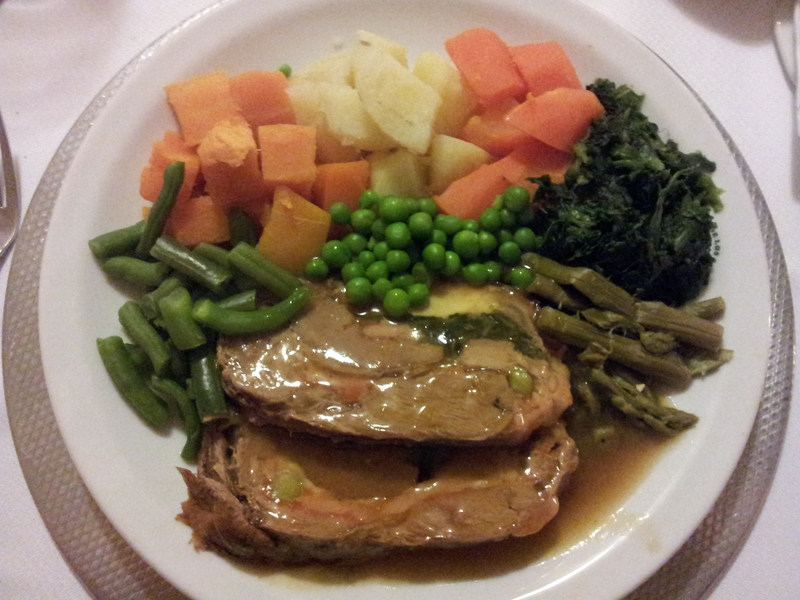 Bland meat, with meagre gravy, stuffed with tasteless spinach and palm hearts and served with equally flavourless steamed pumpkin, potato, beans, carrot, peas and more very bitter spinach (all C/D). 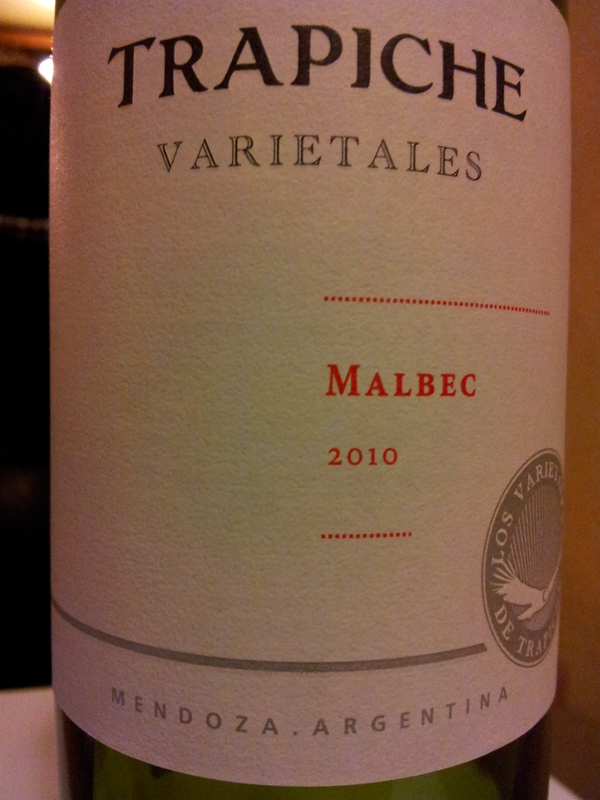 The house red; ‘Trapiche’ Malbec was also a big disappointment (C), the worst wine I’d had so far on this trip. Perhaps I made the wrong choices, or perhaps they’re not as good as they’re cracked up to be. If you take fourth right off Belgrano, down Leonardo Rosales, you will find lots of shops, including a chemists, and a tourist information (do they get any?) in Plaza Almirante Brown, about halfway down the street. Rio Grande is a town to come to do business but not to visit for leisure. Foodwise, they have great ingredients, but choose carefully as to how they are cooked.